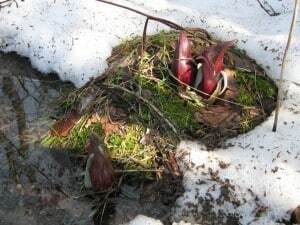 I just wanted to let you know that Skunk Cabbage is now present in the City of Kawartha Lakes in Somerville Township. It is growing in a low floodplain that floods every year. The earliest I have seen the flowers is the last week of March, but this year, with the heavy snow pack, they were almost a month late. CKL FLORA has actually found Skunk Cabbage in Mariposa Tp, South East of Lindsay also, on May 2, 2009.